Any projected opinion on these 2 seals would be greatly appreciated! Thank you! David. Hi I believe these are Chinese. The left one says 馬 meaning "horse" and the right one says 狗 meaning "dog". The left seal says 福 meaning "fortune" and the right one says 萬利 meaning "fortune" as well. 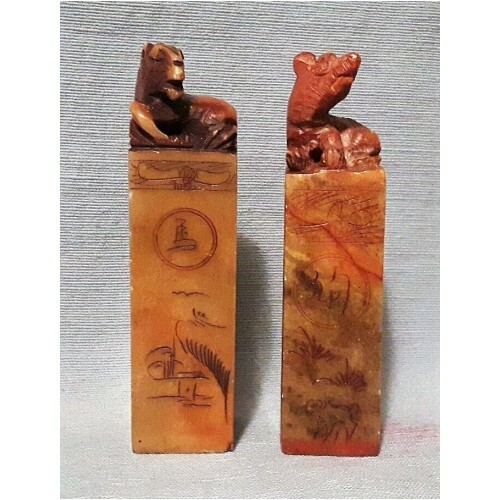 Thy are Chinese and are from a set of twelve stones each with a carved representation of one of the 12 zodiac animals on its top, and the character for the animal on its side. These stones are often used by market stall seal carvers to quickly carve seals for their patrons. They are usually quite ordinary in quality. 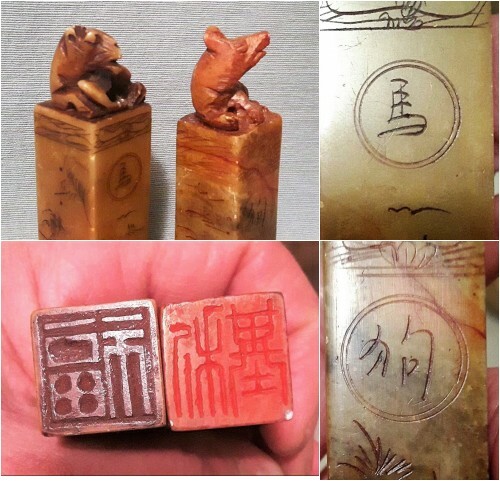 The seal on the left does mean "fortune', but the seal on the right does not read 萬利 but 基利, which does not also mean fortune, but is more likely to be a phonetic rendering of a non-Chinese name - the sound Kili and is perhaps an attempt at a name like Kiri or Kelly. It can be very difficult to create all the sounds of Western names in Chinese.